As model names, Polo and Golf have in each case been with us for around four decades, but of course these justifiably popular Volkswagen models have evolved as the years have passed, and – as has always been the case – the latest versions represent current ‘state of the art’ design and technology. 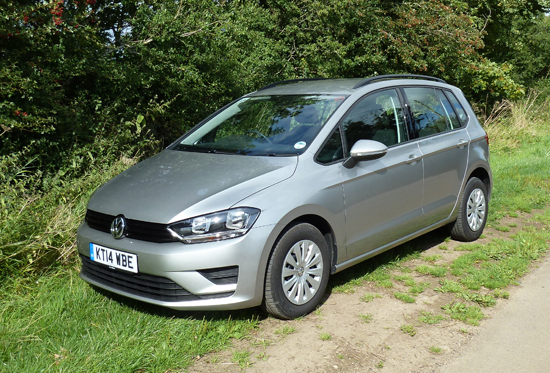 Recently I had the chance to drive a selection of the newest Polo and Golf models from the current VW line-up, in each case trying the car on a variety of roads in and around south Gloucestershire area. By the way… You may be interested to know that available via VW’s website there are excellent detailed explanations of the various technologies incorporated into today’s Volkswagens; for further information have a look at: www.volkswagen.co.uk/technology and then click on the section(s) in which you are interested. What a good idea of VW! Neat, attractive and unostentatious, the contemporary styling of the latest version of VW’s Polo – in this case in SE form – looks good. The Polo – first introduced in 1975 – is a very important model for Volkswagen, being the second most popular seller for the company in the UK, with 42,609 examples sold here in 2013. Of these, 70 per cent found homes with retail buyers. The newcomers are said to be more refined, more efficient and better to drive than their predecessors. Two of the petrol powered motors are three cylinder, one litre units, producing either 60 or 75 PS. Next up the power ladder are two 1.2 litre, four cylinder TSI engines, developing 90 or 110 PS, while topping the petrol output rankings is the 1.4 litre TSI motor, incorporating cylinder deactivation (ACT), and used in the Polo BlueGT. This produces 150 PS (an increase of 10 PS). In case you are wondering what ‘TSI’ refers to, this means VW’s happy combination of the technologies used in their TDI diesel and FSI (‘Fuel Stratified Injection’) petrol engines, to produce motors that are simultaneously compact, powerful, torquey and fuel-efficient. The TSI units combine direct fuel injection and turbocharging, enabling more power and torque, plus improved fuel consumption and emissions, to be delivered by a relatively small petrol engine. For those who prefer diesel power, there are two 1.4 litre, three cylinder TDI turbo diesel engines, delivering either 75 or 90 PS. At this point, for those who may be wondering, it might help to explain that these days ALL Polos feature VW’s fuel and emissions-saving ‘BlueMotion’ technology. So, for example, they all incorporate a ‘Stop/Start’ facility, also a battery recuperation system, to recover energy lost during braking. However, the ‘mainstream’ Polos are not designated ‘BlueMotion’ in terms of model name, which is always reserved for the ultra-efficient versions across the Volkswagen model line-up. For now buyers will have to wait (but only until the end of 2014), for two distinct Polo BlueMotion models (named as such) to arrive. One will feature a 1.4 litre, three cylinder TDI engine, producing 75PS and returning an astonishing 91.1 miles per gallon (together with CO2 emissions of just 82 g/km). The other new Polo Bluemotion will, for the first time, be petrol powered, employing a 1.0 litre, three cylinder unit. This is expected to return 68.9 mpg and 94 g/km CO2. All the latest Polos are now equipped with an Electronic Stability Control (ESC) system, plus ‘Hill Hold’ and Automatic Post-Collision Braking systems – the latter applying the brakes following a collision. Standard too are a modular infotainment system with touchscreen operation and a proximity sensor, plus Bluetooth connectivity and a USB media-in facility. Optional for versions from SE trim level and upwards (and using the touchscreen set-up) is a navigation system, costing £700. The Polos look smart from the rear too. The tailgate hides a generous luggage compartment, although the bumper-height sill is some way from the ground. 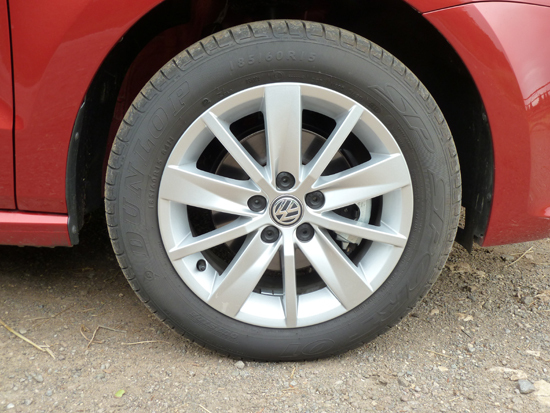 Attractive, easy to clean aluminium alloy wheels are part of the standard specification on the SE variant. 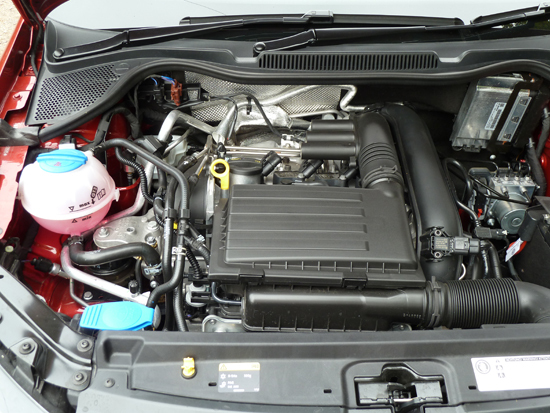 The 1.2 litre petrol-powered Polos have a four cylinder TSI engine (the 1.0 litre cars each feature a three cylinder motor). I started my day by driving (consecutively) two different Polo variants. Both were three door, high specification ‘SE’ versions. This designation means that they feature a long list of useful additional standard equipment over and above the already well-equipped, less expensive ‘S’ version. As examples, SE buyers can enjoy a sophisticated (upgraded) media system, incorporating a clever, 6.5 inch colour touchscreen and a MDI multi-device interface with ‘Lightning’ and 30-pin connectors. Further useful upgrades found in SE versions include a multifunction steering wheel, a ‘variable’ load floor in the boot, air conditioning, and a remote central locking system (with alarm), 15 inch sports aluminium alloy road wheels, and so on. For those seeking further features, there are even higher specification ‘SE’ and ‘SEL’ trim levels. My first outing was in a 90 PS version of the 1.2 litre, four cylinder TSI (petrol) Polo, costing £13,580 ‘On The Road’ before any options (£15,315 as tested, with a navigation system, metallic paintwork, Adaptive Cruise Control, etc.). I found the car very smooth-running, and it provided eager performance. The engine felt very refined, and was almost inaudible at tickover and low running speeds. It was hushed at higher speeds too, and when cruising at 60 mph in fifth (top) gear, the engine was running at just 2,200 rpm. I liked the comfortable seats, and the impressive way in which the suspension dealt with rough tarmac surfaces, transmitting little disturbance to the cabin. 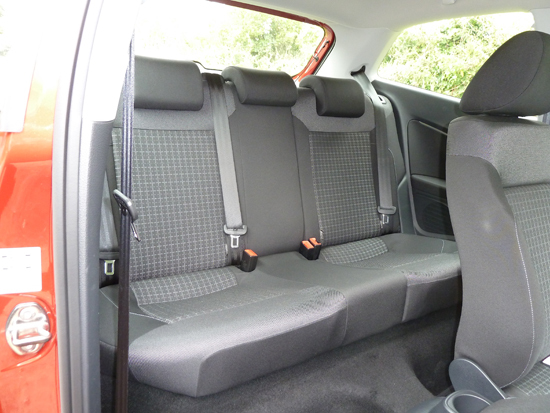 Head room is good throughout the car; rear seat leg room is rather restricted with the front seats positioned towards the rearmost positions on their runners. 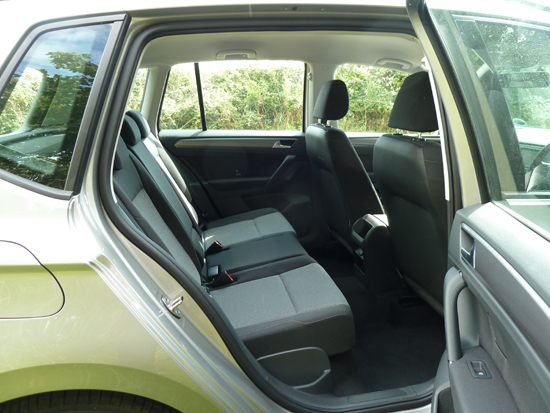 However, the front seats fold forwards and out of the way very easily to allow access to the rear seats. 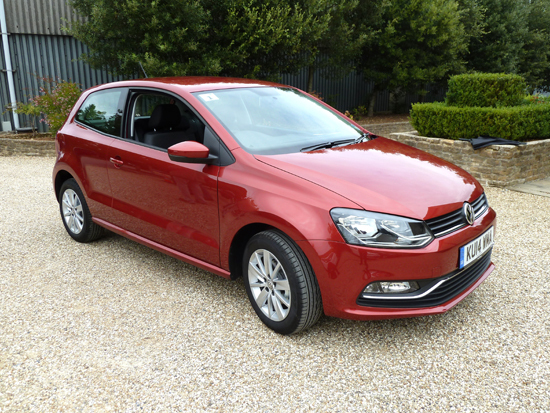 Uncluttered facia design and clear instrumentation are standard features on all Polos. There is room for up to three rear seat passengers, with plenty of head room, but not-so-generous leg room with the front seats set towards their rearmost positions. The luggage compartment on the SE, with its ‘variable’ load floor, is especially practical, allowing tall items to be carried when required, or alternatively providing space beneath the ‘false’ floor for a variety of less bulky ‘things’, at the same time with normal luggage being placed above it. 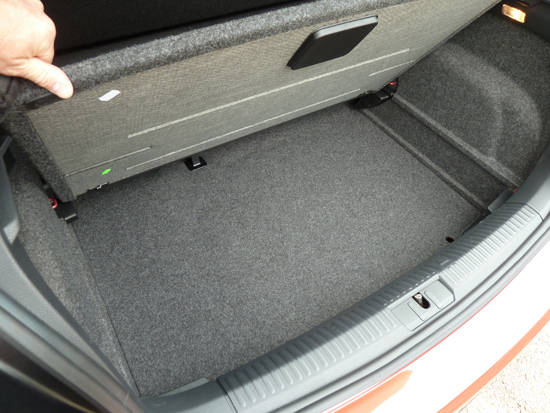 …the boot additionally features a ‘false’ floor. This can be lifted to allow the boot to be made deeper, if required, or can be left in position to provide additional ‘oddments’ stowage beneath the normal floor level. With an official ‘Combined’ fuel consumption figure of 60.1 mpg (which, based on past experiences with a variety of Volkswagens, I have no reason to doubt), plus a CO2 emissions rating of 107 g/km (currently resulting in a zero cost ‘Band B’ road tax band for the first year – and just £20 per annum thereafter), this Polo promises to be inexpensive to run. I next tried the 60 PS, 1 litre Polo (also in SE form, and costing £12,380 before any extras), in this case powered by a three cylinder petrol engine. Naturally, in terms of both power and torque, this felt a little less ‘energetic’ than the 1.2 litre model from which I had just emerged. Nevertheless it was lively enough, and pleasant to drive. Like the 1.2 litre, four cylinder version, this three cylinder model promises 60.1 mpg in terms of the official ‘Combined’ figure, and with CO2 emissions working out just a whisker less, at 106 g/km, it too falls into the same ‘Band B’ for Road Tax purposes. 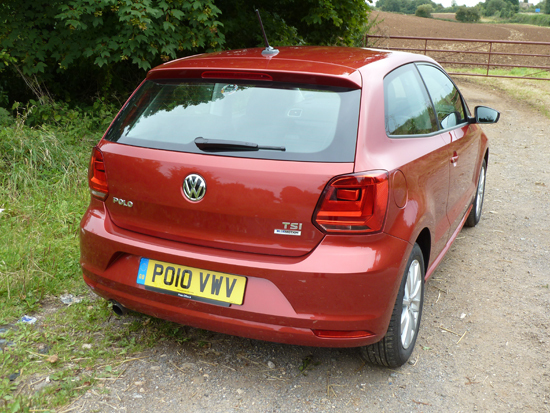 VERDICT – Polos have always been competent small cars; these well thought out latest versions are even better. Looking slightly larger than the standard Golf hatchback, the SV features a longer wheelbase, and is also higher and wider. I next drove a 1.6 litre TDI version of the new Golf SV, in ‘S’ form. This is priced at £21,650 before options are added; £22,185 as tested (with metallic paintwork). Like the ‘Golf Plus’, which it replaces, the new Golf SV is aimed at buyers seeking the well known and loved attributes of the Golf, but within a body shell that provides more space. 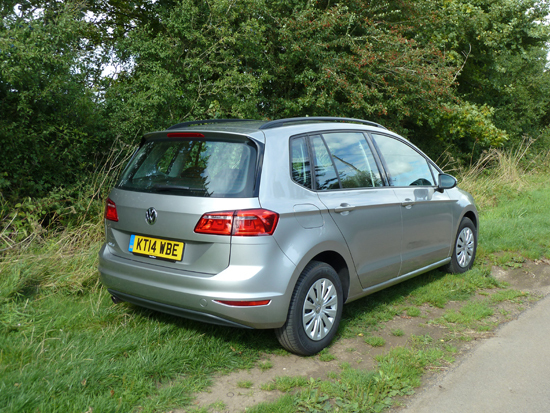 The SV is the third version of the Golf ‘Mark VII’, after the hatchback and estate versions, and in terms of length (and internal roominess) fits between these models. It features a longer wheelbase than the standard Golf hatchback, and is also wider and taller, thus creating more internal space, yet still within a relatively compact ‘footprint’. A useful feature of the SV is that the rear seats can be slid forwards/backwards by up to 180mm (approximately 7 inches), to provide greater versatility in terms of varying passenger/luggage space. 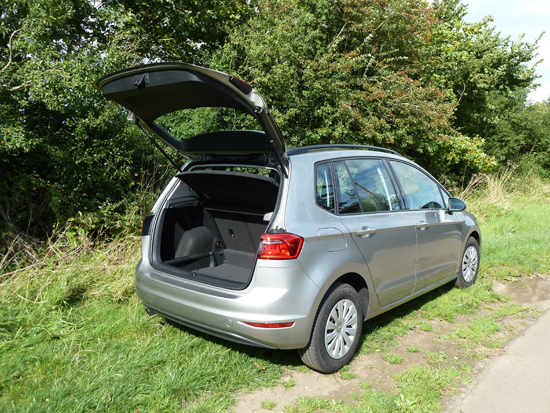 With the rear seats (bench type, split folding on a 60:40 ratio) set to their rearmost position, the SV’s luggage capacity is 500 litres, and said to be 76 litres greater than that of the Golf Plus. These figures compare with 380 litres for the ‘normal’ Golf hatchback, and 605 litres for the Golf estate. With the SV’s rear seats slid fully forward, the available luggage capacity increases to 590 litres, and folding the rear seats pushes the figure up to a cavernous 1,520 litres. 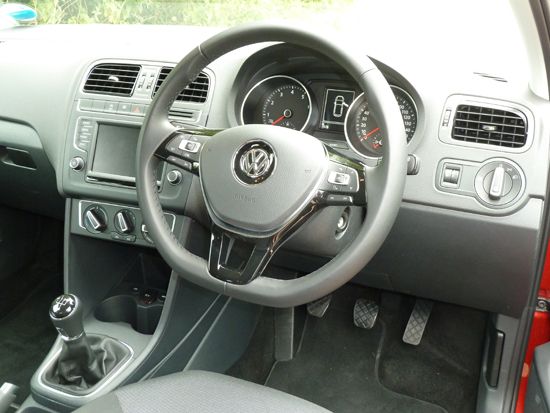 As with the other models in the Golf line-up, the SV incorporates an array of up-to-the-minute safety and convenience features, including standard-fit Automatic Post-Collision Braking, seven airbags (including one for the driver’s knees), a DAB digital radio, an SD card reader and CD player with a 5.8 inch colour touch screen, iPod connectivity, roof rails, air conditioning and an XDS electronic differential (and so on, and so on…). Five door hatchback bodywork is standard with the SV; the front and rear doors are wide-opening, providing easy access to the interior. Under the bonnet of the 1.6 litre TDI as test-driven is a 110 PS version of VW’s refined and economical four cylinder turbo diesel engine. The Golf SV features smart facia design, incorporating easy-to-read instruments. It also features VW’s latest generation of electro-mechanical power-assisted steering, which varies the ‘feel’ of the steering according to speed and the driving situation, and is able to compensate for cross-winds, steep road cambers, etc. This type of steering system aids fuel economy too. Buyers can choose from three trim levels (in ascending order, S, SE and GT). Engine choices include two 1.2 litre turbocharged petrol units (85 or 110 PS), two 1.4 litre turbocharged petrol motors (125 or 150 PS), and three turbo diesels – two 1.6 litre units (90 or 110 PS) and a 2.0 litre engine developing 150 PS. The SV BlueMotion, based on the ‘S’ trim level and fitted with the 110 PS version of the 1.6 litre TDI engine, achieves a ‘Combined’ fuel consumption figure of 78.5 mpg, and a CO2 rating of 95g/km (qualifying the car for a zero rate of road tax). On a mixture of Cotswold country roads, from smooth-surfaced, sweeping fast routes to bumpy, narrow lanes, I found the SV was comfortable and mechanically refined. The ride quality was good, and the seats accommodating for my frame. The interior is particularly spacious, with excellent head and leg room throughout, and the ability to vary the position of the rear seats (as described earlier) helps to optimise the generous load carrying space according to specific needs. 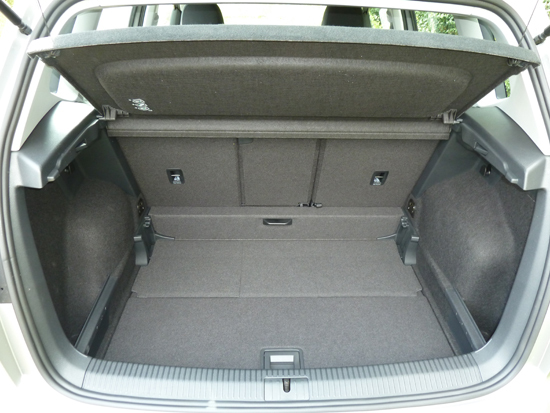 The wide-opening rear doors allowed easy entry to, and exit from, the rear seats. The test car was equipped with a five speed manual gearbox, with a precise, easy-action gearchange which was a pleasure to use. I found that the 1.6 litre, 110 PS diesel engine was powerful yet smooth-running, with bags of pulling power available from low engine speeds. Indeed the engine’s maximum torque is produced all the way between 1,500 and 3,000 rpm – especially helpful in town driving and when touring in hilly districts (etc.). Cruising at high speeds was pleasurable too. On the open road at 60 mph in fifth (top) gear, the quiet-running engine required just 1,800 rpm. With an official ‘Combined’ mpg figure of 72.4 mpg (and ‘Urban’ consumption of 62.8 mpg), fuel costs should be minimal. The CO2 emissions rating of 101 g/km puts this SV just outside the ‘magical’ 100g/km threshold for zero rate road tax, but even so, the ‘Band B’ rating means that the road tax for the first year will be free of charge, and (at current rates), just £20 per year thereafter. There is plenty of room in the SV for up to five adult passengers to travel in comfort. Open wide! The high-lifting tailgate, which opens from bumper level, allows easy access to the load compartment. 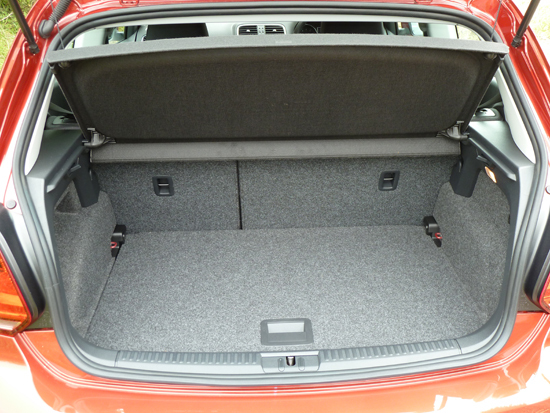 There’s loads of space for luggage, and the load compartment’s capacity can be varied considerably by setting the rear seat position as required (please see main text). 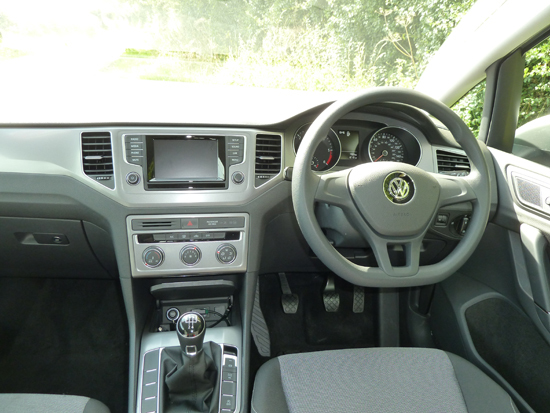 VERDICT – spacious, highly versatile, likeable and economical vehicle, ideal for family use. The new Golf R looks the part, but in an under-stated manner. Brilliantly done, in fact. My last drive of the day took the form of a short run in the new Golf R, powered by a two litre TSI turbocharged direct injection petrol engine, incorporating variable valve timing and delivering 300 PS. This rapid machine – indeed the fastest accelerating Golf so far produced – is priced at £31,970 ‘On the Road’ (before any options are added – the test car was laden with extra goodies, including a navigation system, Dynamic Chassis Control, a ‘Winter Pack’, extra special sports wheels, etc, adding up to a total of £36,335). Interestingly, this is the first ESC-equipped Volkswagen that can have the system deactivated for use on track. (Note: ‘ESC’ stands for ‘Electronic Stability Control’ – anti-skid technology which in normal road use detects difficult situations to prevent skidding before it occurs). 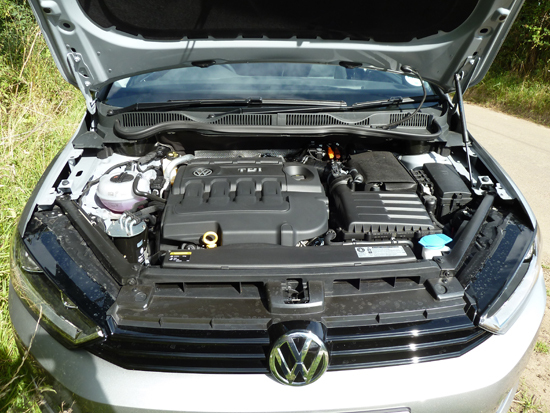 Under the bonnet is a freshly developed version of VW’s four cylinder, 16 valve 2.0 litre EA888 TSI petrol power unit, also used in the Golf GTI, but in the ‘R’ this motor produces a thumping 300 PS between 5,500 rpm and 6,200 rpm. The additional output is made possible by equipping the engine with a modified cylinder head, together with many other upgraded components, including the exhaust valves, valve seats and springs, pistons, injection valves and turbocharger. The engine produces huge amounts of torque too; some 280 lb.ft. all the way from 1,800 rpm to 5,500 rpm! Transmission is via a six speed DSG gearbox (twin clutch, electronically-controlled transmission, enabling ultra-rapid ratio changes) and a fifth generation Haldex 4MOTION four wheel drive system. Under conditions where loads are low, or if coasting, the rear wheels are decoupled from the drivetrain (so the car runs with front wheel drive only), to minimise petrol consumption. When required, drive to the rear axle can be engaged almost instantaneously by activating an electro-hydraulic pump to switch the Haldex coupling into four wheel drive mode. Almost 100 per cent of the driving power can be transmitted to the rear wheels. Compared with standard Golfs, the ride height is 20mm lower (and 5mm lower than that of the GTI). Optionally available (costing an additional £815) is ‘Dynamic Chassis Control’ (‘DCC’), which enables the driver to modify the characteristics of the car’s suspension towards greater comfort or improved control of the body. The Golf R’s ‘driver profile selector’ (standard-fit in all Golfs from SE trim level upwards) has a ‘Race’ mode too, which accentuates throttle response, and amends the gearshift pattern of the DSG gearbox, towards more sporty driving. The steering has also been amended for the Golf R, with a ‘progressive’ system in which the number of turns from lock to lock has been reduced from 2.75 to just 2.1 – enabling more rapid steering responses. Braking is by large ventilated discs at both the front and rear. The new model is externally distinguished by its new front bumper incorporating large air inlets, a front grille sporting the ‘R’ logo, body-coloured side sills, quad exhaust pipe outlets, daytime running lamps built into the standard bi-xenon headlamps, and 18 inch sports aluminium alloy wheels (19in types are optional). The inside story features cloth-trimmed seats with bolsters furnished in Alcantara, and the instrument panel is unique to the ‘R’. In the practicality stakes, the five door bodywork of the example I drove is similar to the less powerful Golf hatchbacks in the range. So there’s a reasonable amount of space for all passengers, and a generous luggage compartment. In addition, the car features the same levels of safety, comfort and convenience features as found in other Golfs. Importantly, standard equipment on the ‘R’ also includes VW’s ‘PreCrash’ system, Automatic Distance Control, Front Assist, City Emergency Braking and a Driver Alert set-up. 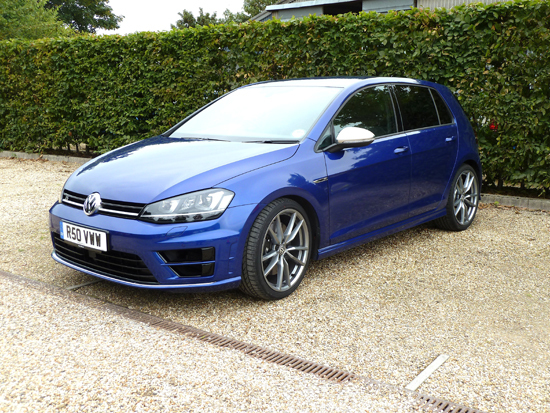 Prices for this model start at £29,900 for the three door with a six speed manual gearbox, and £31,315 if equipped with the six speed DSG transmission. Equivalent prices for the five door versions are £30,555 and £31,970 respectively. I thoroughly enjoyed this Golf’s rapid performance and competent, sure-footed handling. Sure, it is fast – in fact, VERY fast, but it feels reassuringly safe too, and responds instantly to a driver’s commands. Performance is scintillating, with the steering-wheel mounted paddles giving near-instant ratio changes when required. Switching between ‘normal’ and ‘Sport’ drive modes is also ultra-rapid. (Incidentally, for ratio changes there’s a centre console mounted gearchange lever, in addition to the paddles). This is a car you need to watch in terms of speed, since it reaches the UK’s legal maximum speeds so very rapidly, calmly, relatively quietly and without any drama – in other words you are very soon travelling much faster than you might think! The claimed top speed is electronically limited to 155 mph, having passed through the 62 mph mark, from rest, in just 4.9 seconds for the DSG-equipped versions (5.1 seconds for the manual gearbox – compared with 5.7 seconds for the previous version). For the DSG transmission model, the official ‘Combined’ fuel consumption figure is a creditable 40.9 mpg (‘Urban’, 32.1 mpg), with a CO2 emissions rating of 159 g/km (compared with a ‘Combined’ figure of 39.8 mpg and a CO2 rating of 165 g/km for the manual gearbox ‘R’). Despite an additional 30 PS being available, VW engineers have managed to squeeze more miles per gallon from this engine, compared with that of its predecessor (in fact fuel economy has improved by up to 18 per cent). I found the ride quality to be firm but not uncomfortable. ‘On the road’ price: £31,970 (our test car, fitted with a range of optional equipment, £36,335).